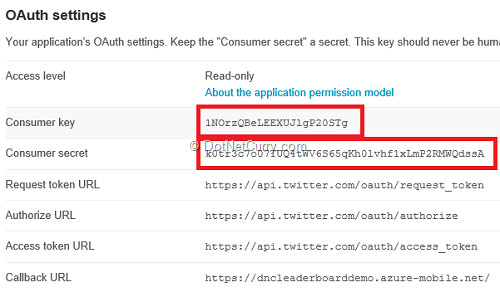 Abstract: In this article, we will see how to enable Twitter OAuth for a Zumo Service. We will also see how to use it in a Window 8 game and how we can reuse the credentials for a nice User experience. 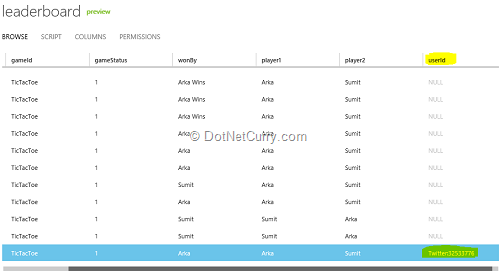 In my previous Zumo article Integrating a Windows 8 Store Game with Azure Mobile Services a.k.a Zumo, I showed how we could store game results of a Windows 8 game in Azure using Azure Mobile Service (Zumo). While building the app, we set it up such that anyone with the Zumo Application Key could post data. Today we will see how we can tighten things up a little and use an OAuth Service to authenticate the data submission process. Here we continue with our Tic-Tac-Toe Windows 8 game that we built in our previous article. 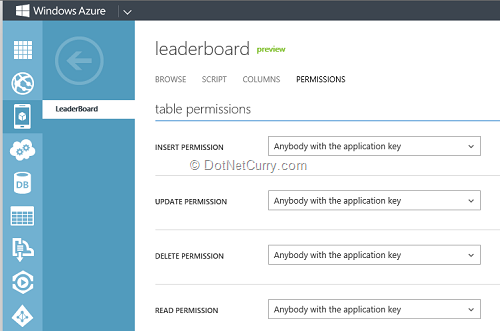 If you want, you can create a new Application and get started with that or follow the previous article on how to create a new Windows Azure Mobile Service. Now if the application tries to Save the Game Result an ‘Unauthorized’ exception will be thrown. 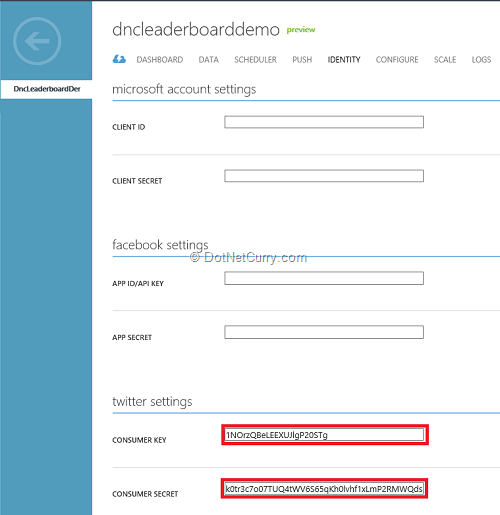 Step 5: After saving the permissions, navigate back to the Service dashboard and click on the Identity Tab. 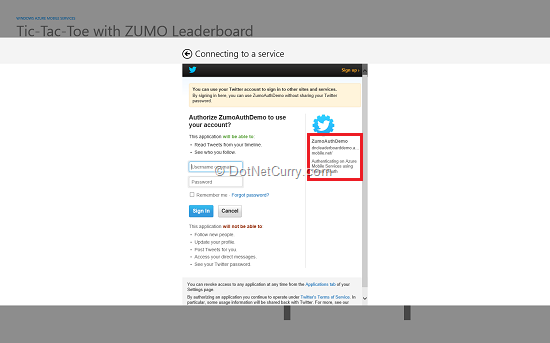 Step 7: Setting up Zumo to use Twitter. - Once the Twitter application is created, on the details page you’ll see the Consumer Key and the Consumer Secret. - Switch back to the Zumo service application and provide the keys in the respective fields on the Identity Tab. 1. In the MainPage.xaml.cs add the following snippet. MessageDialog is defined in the Windows.UI.Popups Namespace. 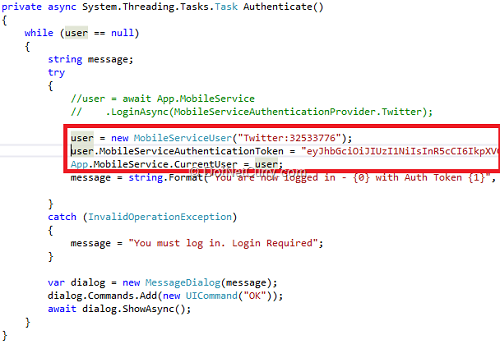 As you can see, our App is now using Twitter Auth for authentication. On successful Authentication, you’ll get a popup like the following. The ID is what Zumo uses as your ID. 4. Now when you complete the Game, the App will post data to Zumo using the credentials! Yay! That’s it, you have enabled Authentication for a Zumo service. Now that we are authenticating users, it will be good to store the UserId with our game score. - Now complete a game to send the updated data structure to Zumo. Since we have kept Schema as Dynamic, Zumo will automatically add the column and insert the data in the new column. Now that Authentication is working fine, let’s see if we can enhance the user experience a little. Currently the application asks for login information every time the game starts. This is unlike other OAuth clients where you give permission once and the application can use the permissions until the user revokes permission to this app from the OAuth source. This makes giving permission a one-time affair. How can we possibly replicate it in our app? Fortunately, Zumo’s client SDK has made this very easy too. Let us Copy the values in MobileServiceAuthenticationToken and UserId and say put them away in Notepad. As you can see, we have hardcoded the UserId and the MobileServiceAuthenticationToken to the value returned previously. Next we have assigned the newly instantiated user object to the App.MobileService.CurrentUser. That’s it. Now if we run the application, our App will be again able to submit data and this time we won’t get the Authentication dialog. In the above sample, I simply hard-coded the credentials. This is not a real solution. In real world apps, you will have to come up with some kind of a secure caching mechanism to save the UserId and MobileServiceAuthenticationToken. You can write it to an encrypted file and on application start check for the file and load+decrypt Authentication Information if it exists. If not, show the Authentication dialog. Try not to save the credentials in plain text. So that’s a wrap for Zumo Authentication. 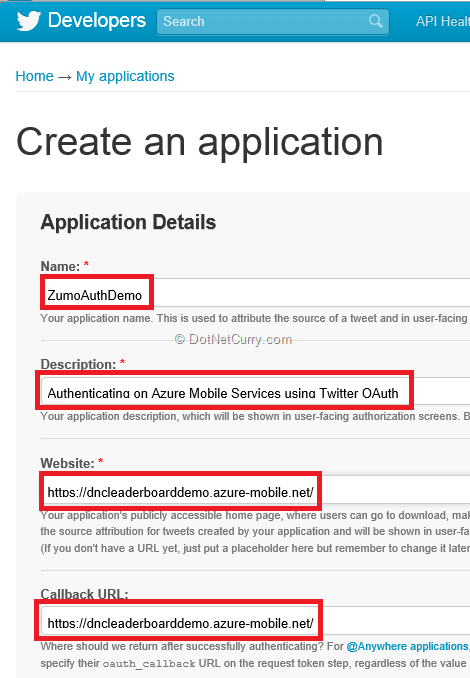 We saw how we could enable Twitter OAuth for a Zumo Service. We also saw how to use it in a Window 8 game. Finally we saw how we can reuse the credentials for a nice User experience. The Zumo service is providing lots and lots of pleasant surprises as we explore it, be it flexible data storage or OAuth integration. Up next, in a few days we’ll explore what it takes to implement push notifications.